Setting up portable gazebos and screened gazebos is a great way to add extra shelter and space to your yard or backyard barbeque. It gives you shelter from the hot sun, and if screened in, keeps insects out well into the night. They are a wonderful way to entertain and a great addition to a camp site. But many people who set up portable gazebos, on their back lawn are faced with how to keep it there without it blowing away in that wind. Usually you would use tie downs, which is similar to putting up a tent you have strings and tent pegs. But these can look ugly and many people just end up tripping over them, or what if you want to put one on your deck? If you want to erect a portable or a screened in gazebo on your deck or patio, then the tie down kits are not going to do you much good. Many people will permanently install the supports of the shelter onto their deck and just take down the covering for the winter months and reinstall the next spring. But what if you don’t want it to be permanent? What if you are renting the property or you just want a portable shelter for a specific event? 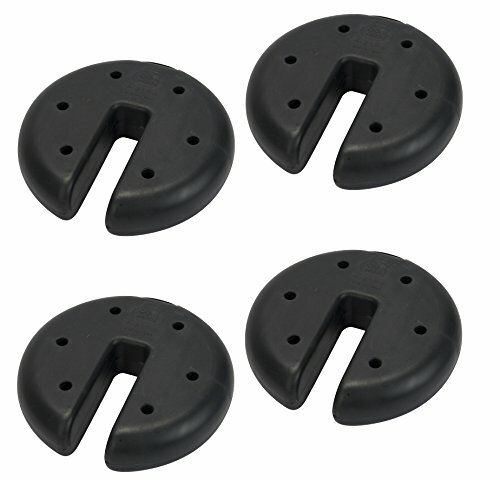 Then you should consider weighted blocks specifically designed for gazebo supports. These are really cool. They weigh 5 pounds each and come in a set of four. So, you have 20 pounds of weight spread out between the supports. They don’t take up much room, as you can see by the picture they fit the legs or any other similar structure you may have. If you are concerned about wind, you could double them up, but these kits do quite well for portable gazebos. All you do is erect your frame, and place these specially designed weights or sometimes called “portable sports cement” onto the supports and now you have a shelter ready for that barbeque or party. These work really well on solid surfaces such as concrete, wood or pavers, but they also work well out on the grass too! This way you can come away from the guy wires and pegs that have to be hammered in, and tend to get tripped over. 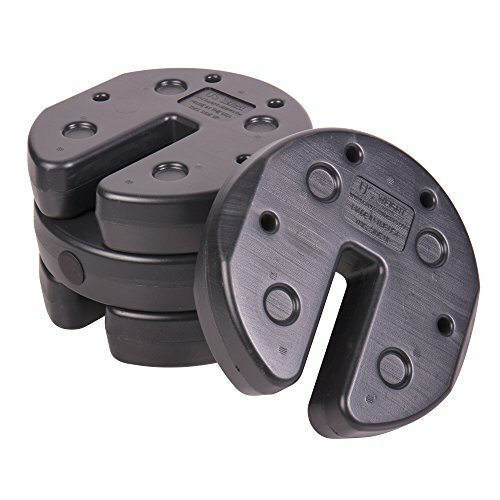 So, if you are holding an event such as a garage sale, or having a party in your backyard and want to put up a temporary shelter or gazebo, then consider these weights instead of trying to us gazebo tie down pegs. Garage sales are a great place to put up a gazebo. You can stay out of the sun while serving people. Or you can have more valuable items under the gazebo on your driveway. By using the weights, you can put one of these up pretty well anywhere. They are compact and do the trick quite well. They are small and compact and can fit in your van for that next camping trip. If you sell crafts or anything at a market, using portable gazebos is a great way to go. Stopping it from falling down is much easier with this type of product. They are small and compact and do the trick. No more trying to figure out what to tie it to, or looking high and low for those gazebo tie downs you know you had somewhere. So, this year, get that portable gazebo up in a hurry, slide these weights into place, and you are done. They are well out of the way and work like a charm for anywhere you want. Just as easy to take down. No hammers and no trying to yank the spikes out of the ground. Enjoy more entertainment area with portable gazebos and weighted blocks instead of gazebo tie downs this year. Also see setting up a gazebo bar and grilling station.